The Provost has established a new campus-wide position that will assist in the coordination and stewardship of campus fine art collections. The art collections at Cal Poly have significantly grown over the two past decades and this is an important step in assuring coordinated and effective stewardship of these important cultural resources. Cal Poly staff member Catherine Trujillo, a trained registrar and cultural collections manager, has been appointed to this part-time appointment, through September 2014. Her professional work and her active roles in the campus and regional arts communities make her uniquely qualified to support campus stewardship of art collections. As curator for campus art collections and reporting to the Office of the Provost, Catherine will collaborate with campus stakeholders to identify fine art collections held by various campus departments acquired through gift or purchase, and lead the development of inventories, catalogs, and administrative records for campus artwork held by various campus organizations and units. Catherine has over twenty years experience working as a trained registrar and collections manager with archival and museum collections in a variety of organizations. She joined the library’s Special Collections department in 2001 to oversee collections of rare books, manuscripts, architectural drawings and photographs. In 2013 she took on new library-wide roles as a member of the library’s Communications and Special Initiatives team. Catherine leads the design, development, and assessment of exhibits programs, including traveling exhibits such “With Our Own Eyes,” on exhibit in October 2013 at the Cal Poly MultiCultural Center. In addition, Catherine serves on the executive board as treasurer of the Chicano Latina Faculty Staff Association at Cal Poly. Catherine holds professional memberships with the Society of California Archivists; Western Museums Association; California Association of Museums; and Registrar’s Committee Western Region (RC-WR). Her professional appointments include serving as former co-chair for the Registrar’s Committee Western Region (RC-WR) — Southern California, and on the Consortium of University Library Exhibit Programs. In the community she is a member of the San Luis Obispo Museum of Art Permanent Collection Committee and serves on two nonprofit boards: the Central Coast Center for Arts Education; and the San Luis Obispo Child Development Resource Center’s smART Studio. She also co-curates Pecha Kucha Night, which brings together designers, writers, artists, researchers, and community leaders for a fast-paced digital slide show. Catherine can be reached in the Kennedy Library at (805) 756-6395; and by email at: ude.yloplacnull@llijurtc. Photo: Curator Catherine Trujillo and gallery student assistant Vanessa Pham catalog a sculpture by Santa Barbara artist Donald Davis, donated to the university in 1990 by Dr. C. Baring Farmer. 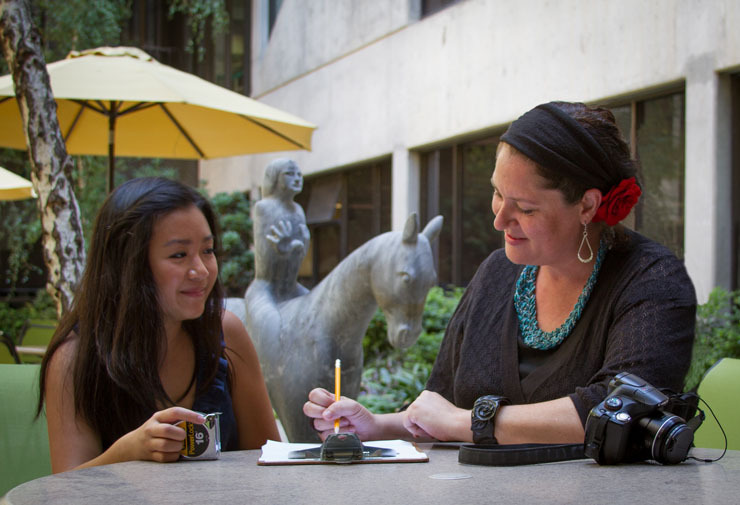 Read more on cal poly art, campus art curator, and Catherine Trujillo.